5674 ✉ 84FDC 1 Fr. 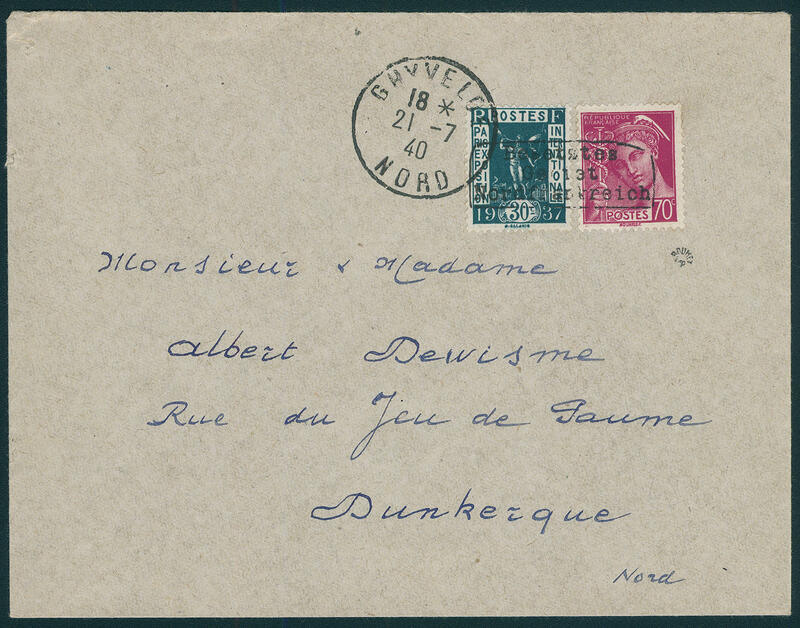 Iris, type I, as correctly franked single franking on locate first day cover from \"DUNKERQUE 1.7.40\" with arrival postmark. Rare. Photo expertize \"the condition is perfect\" autumn VP. 5675 ✉ 85 1 Fr. 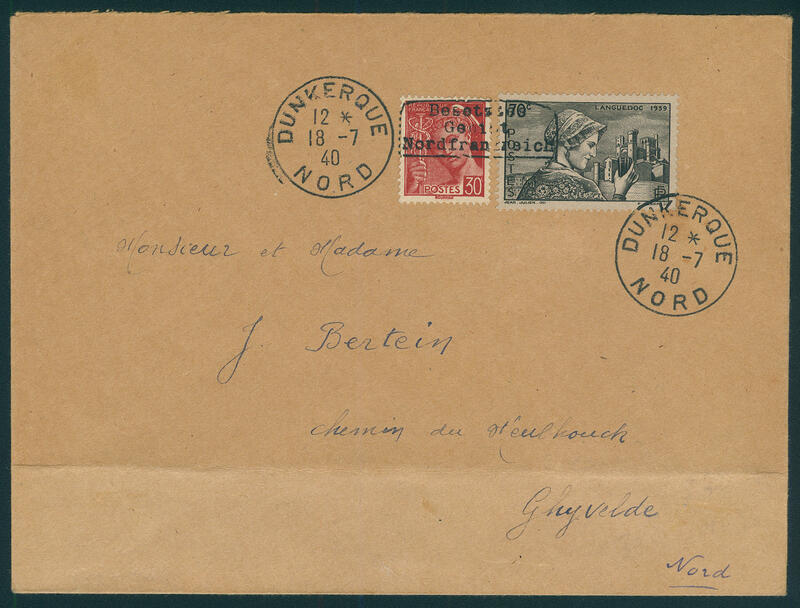 Iris, type I, as correctly franked single franking on cover from \"DUNKERQUE 2.7.40\" to Rosendael with arrival postmark. Minimal gum spots. Rare. Photo expertize \"the condition is perfect\" autumn VP. 5676 ✉ 85 1 Fr. 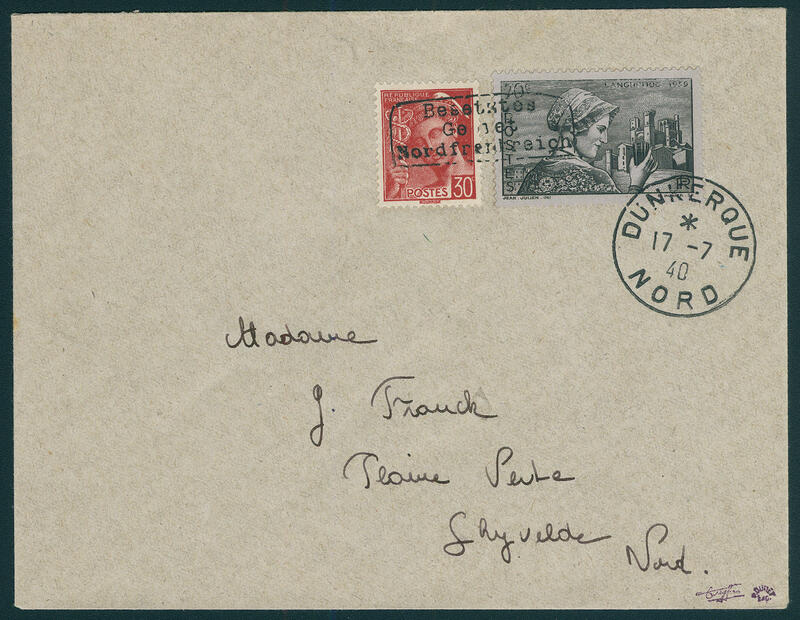 Iris, type I, as correctly franked single franking on cover from \"DUNKERQUE 2.7.40\" to Rosendael with arrival postmark. Scarce destination. Photo expertize \"the condition is perfect\" autumn VP. 5677 ✉ 85 1 Fr. 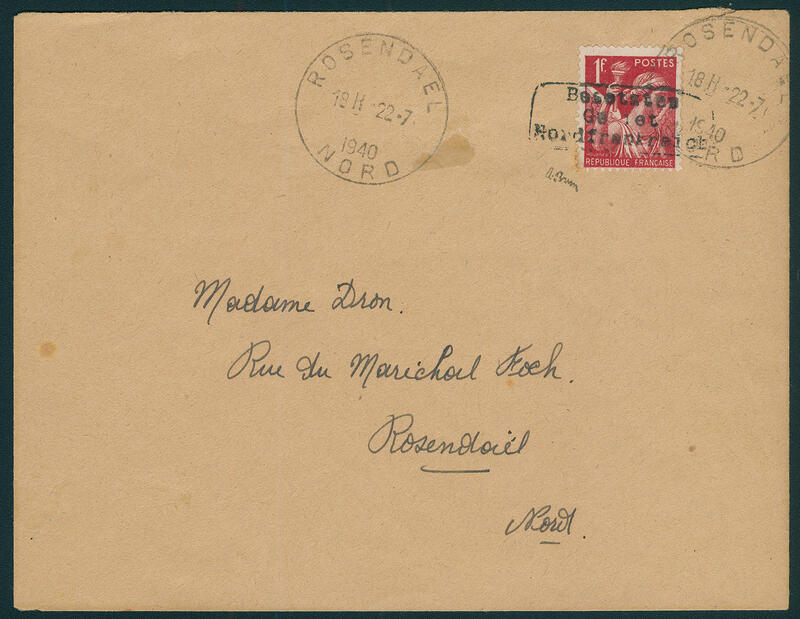 Iris, type I, as correctly franked single franking on cover from \"DUNKERQUE 2.7.40\" to Rosendael with arrival postmark. Minimal gum spots. Scarce destination. Photo expertize \"the condition is perfect\" autumn VP. 5678 ✉ 85 1 Fr. Iris, type I, as correctly franked single franking on local letter from \"ROSENDAEL 22.7.40\" with arrival postmark. Slight traces of usage as well a short perforation. Rare. Photo expertize \"the other condition is perfect\" autumn VP. 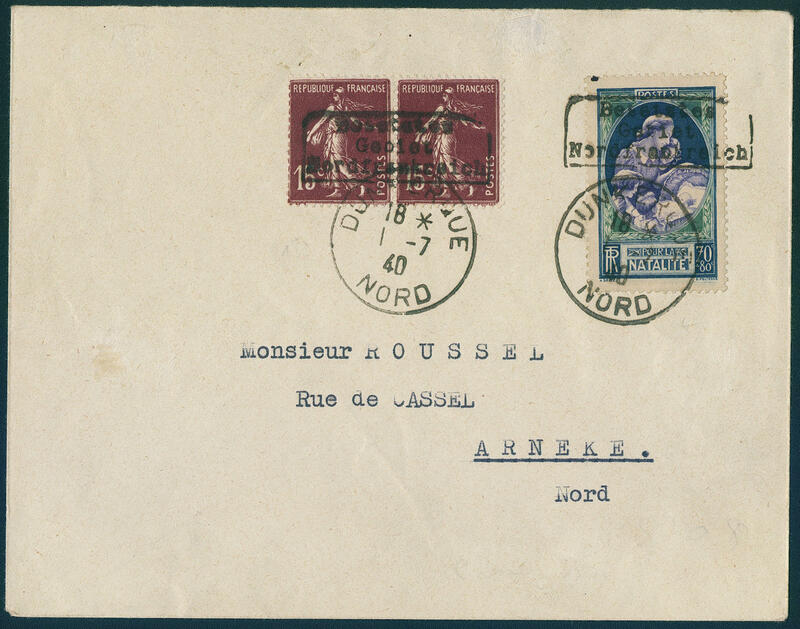 5679 ✉ 89,145 20 C. Monument and 80 C. Marshal Joffre, in perfect condition on very nice cover with turning into overprint in type I from \"DUNKERQUE 14.7.40. 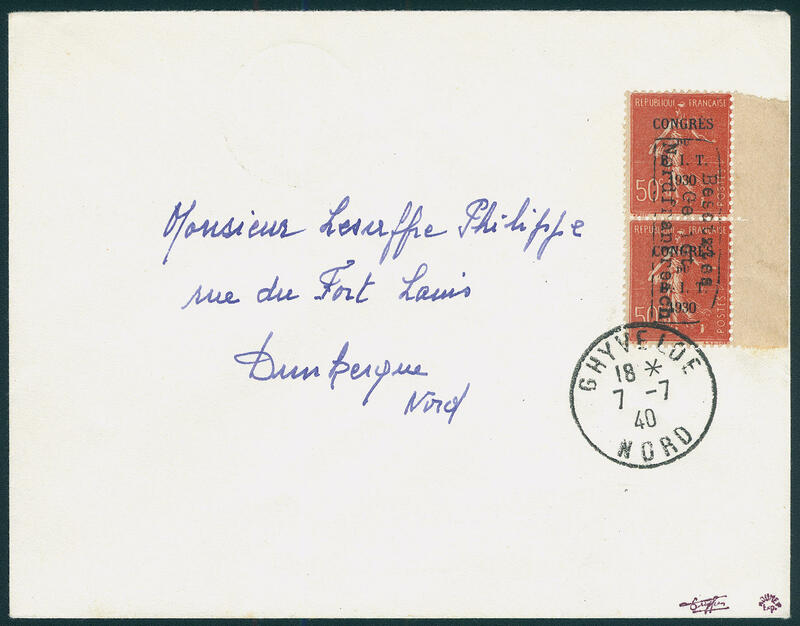 \" to Ghyvelde with arrival postmark. Very rare! Photo expertize \"the condition is perfect\" autumn VP. Michel 1400,- €. 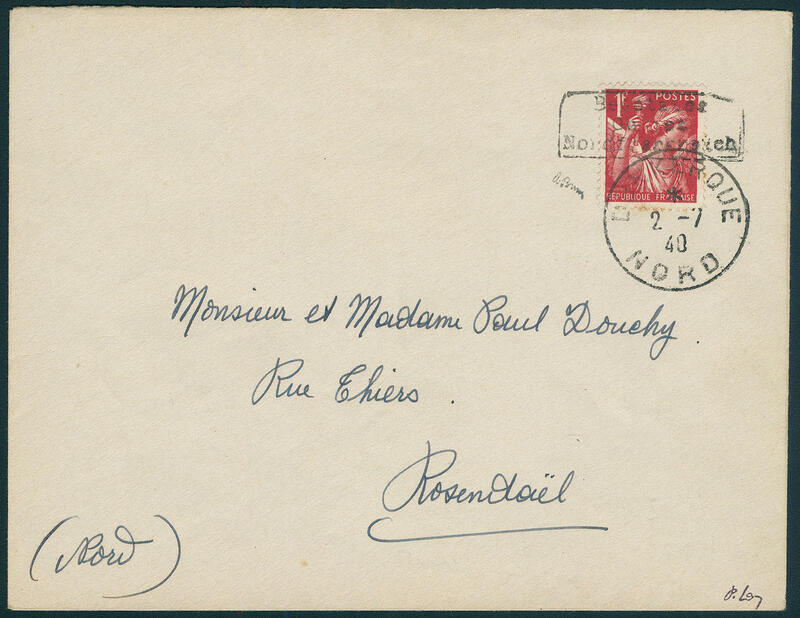 5680 ✉ 93,76 30 C. World exhibition Paris with 70 C. Merkur, type I, with double overprint, as correctly franked mixed franking on cover from \"GHYVELDE 21.7.40\" to Dunkirk with arrival postmark. Very rare. Photo expertize \"the condition is perfect\" autumn VP. 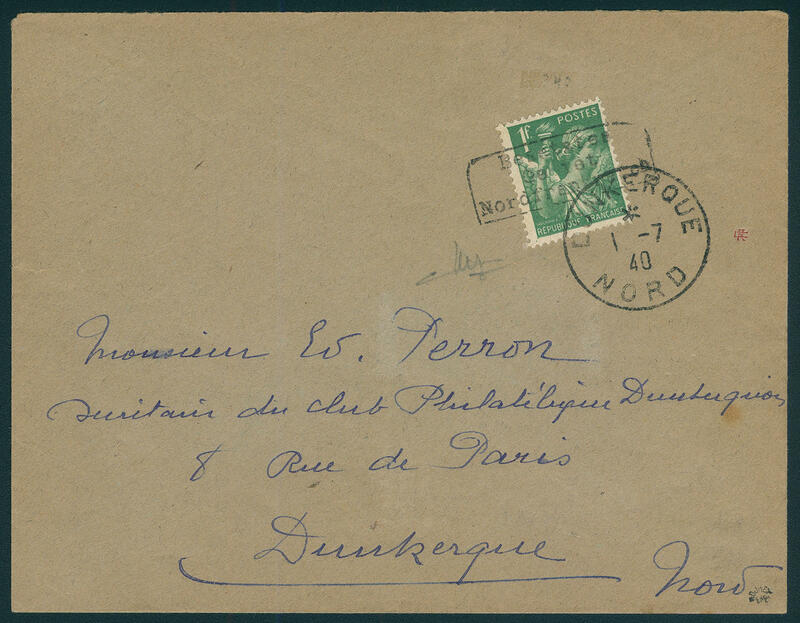 5681 ✉ 93,76 30 C. World exhibition Paris with 70 C. Merkur, type I, as correctly franked mixed franking on cover from \"GHYVELDE 21.7.40\" to Dunkirk with arrival postmark. Rare. Photo expertize \"the condition is perfect\" autumn VP. Michel 900,- €. 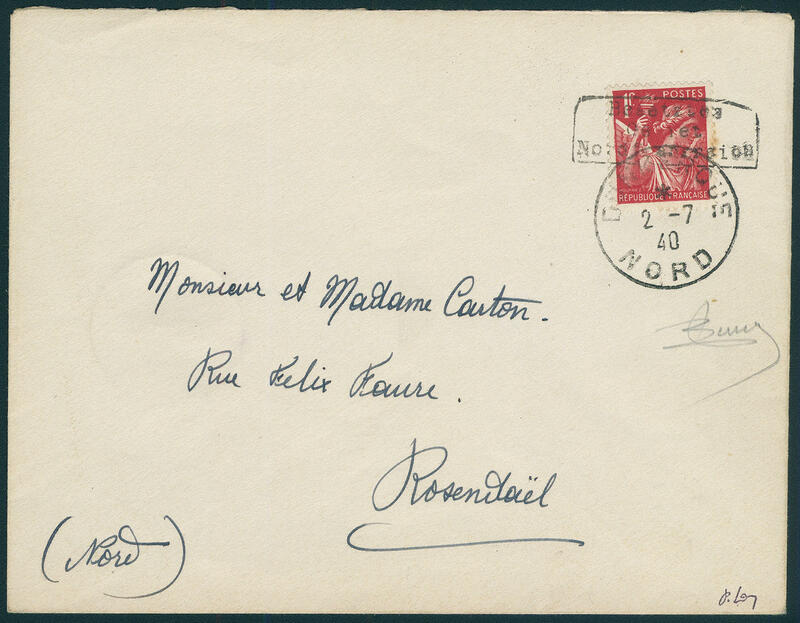 5682 ✉ 102,62 40 C. World exhibition, in perfect condition with additional franking of a horizontal pairs the 30 C. Merkur (right stamp a perf shortened) on First Day Cover, cover slight traces of usage and at the bottom horizontal folded, from \"DUNKERQUE 1.7.40. 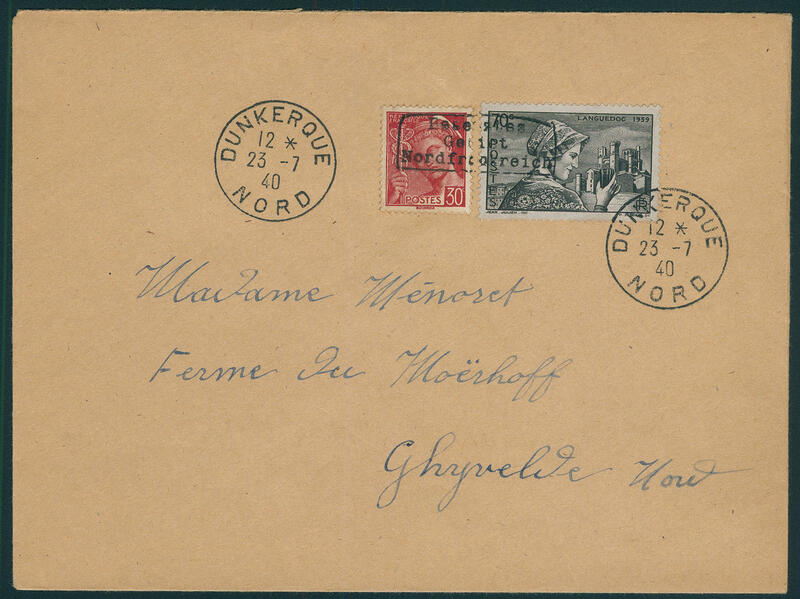 \" to Arneke with arrival postmark. Photo expertize autumn VP. 5683 ✉ 105,54,65 40 C. Chavannes with 15 C. And 45 C. Merkur, type I, as correctly franked mixed franking on cover from \"DUNKERQUE 11.7.40\" to Ghyvelde with arrival postmark. Rare. Photo expertize \"the condition is perfect\" autumn VP. Michel 1400,- €. 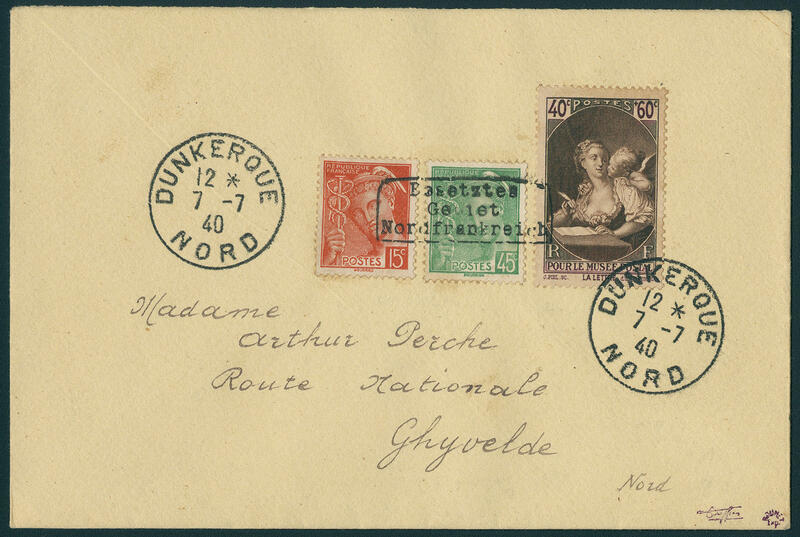 5684 ✉ 106,54,65 40 C. Postal Museum Paris with 15 C. And 45 C. Merkur, type I, as correctly franked mixed franking on cover from \"DUNKERQUE 7.7.40\" to Ghyvelde with arrival postmark. Rare. Photo expertize \"the condition is perfect\" autumn VP. Michel 1400,- €. 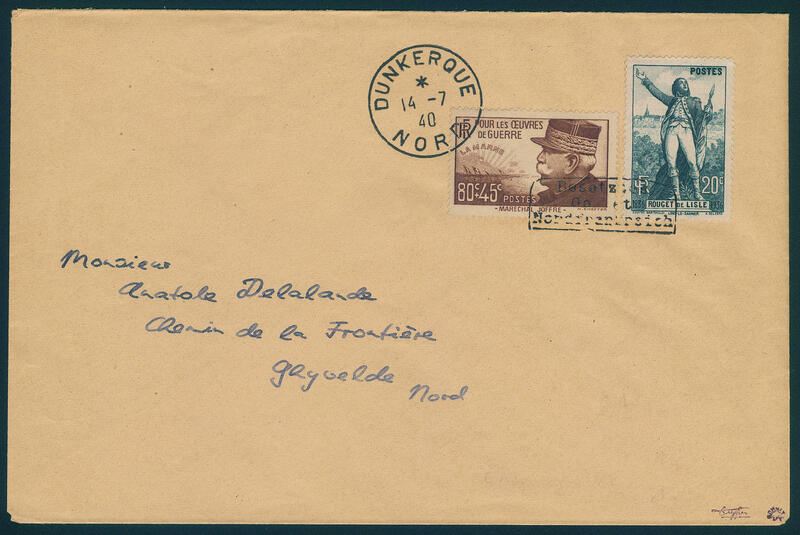 5685 ✉ 107,62 40 C. Soldiers and 30 C. Merkur in the vertical pair with overprint in type I on First Day Cover from \"DUNKERQUE 1.7.40. \" to Arneke with arrival postmark. Partly a little shaded / gum spots. Photo expertize autumn VP. 5686 ✉ 110 50 C. Congres you B. I. T. 1930, type I, in the vertical pair from right margin of sheet, as correctly franked multiple franking on cover from \"GHYVELDE 7.7.40\" to Dunkirk with arrival postmark. Rare. Photo expertize \"the condition is perfect\" autumn VP. 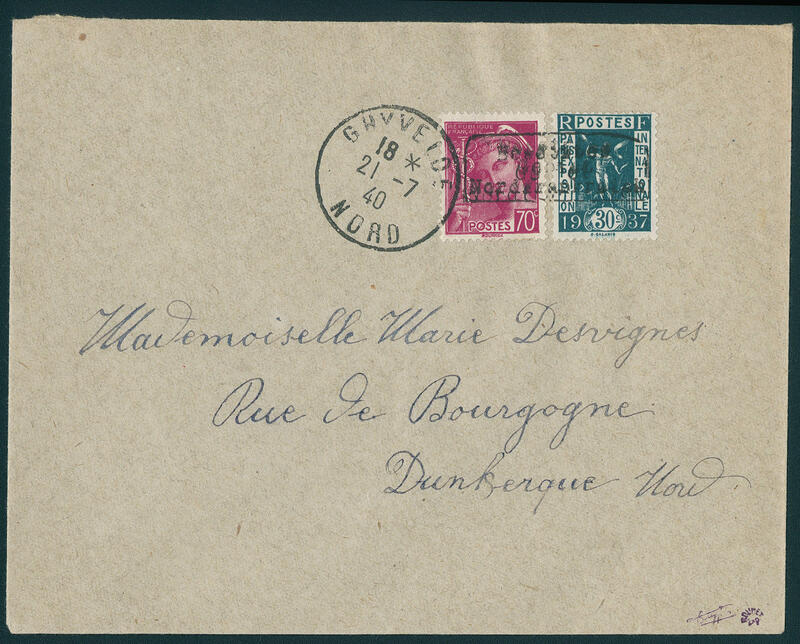 5687 ∆ 133,62 70 C. Languedoc with 30 C. Merkur, type I, as correctly franked mixed franking on cover front from \"DUNKERQUE 17.7.40\". Photo expertize \"the condition is perfect\" autumn VP. 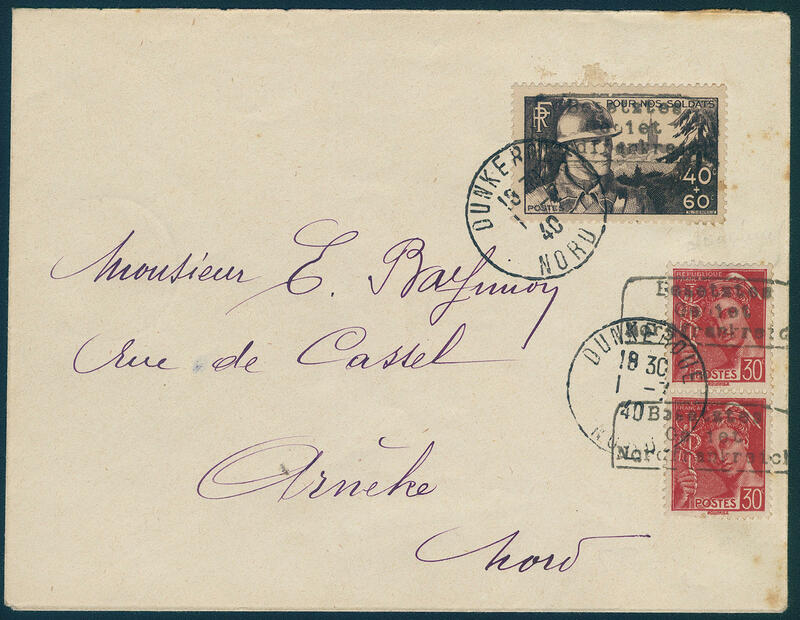 5688 ✉ 133,62 70 C. Languedoc with 30 C. Merkur, type I, as correctly franked mixed franking folded cover from \"DUNKERQUE 18.7.40\" to Ghyvelde with arrival postmark. Rare. Photo expertize \"the other condition is perfect\" autumn VP. 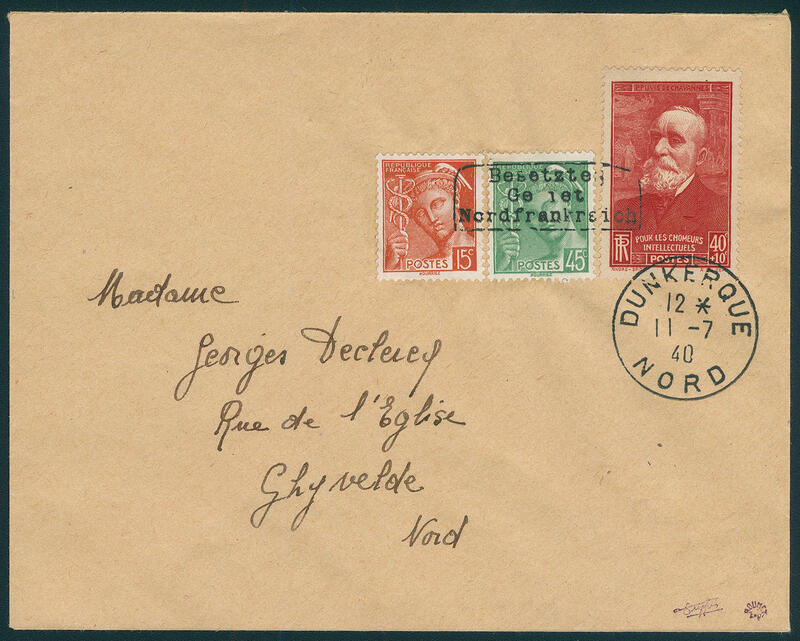 5689 ✉ 133,62 70 C. Languedoc with 30 C. Merkur, type I, as correctly franked mixed franking cover from \"DUNKERQUE 23.7.40\" to Ghyvelde with arrival postmark. Rare. Photo expertize \"the condition is perfect\" autumn VP. Michel 700,- €. 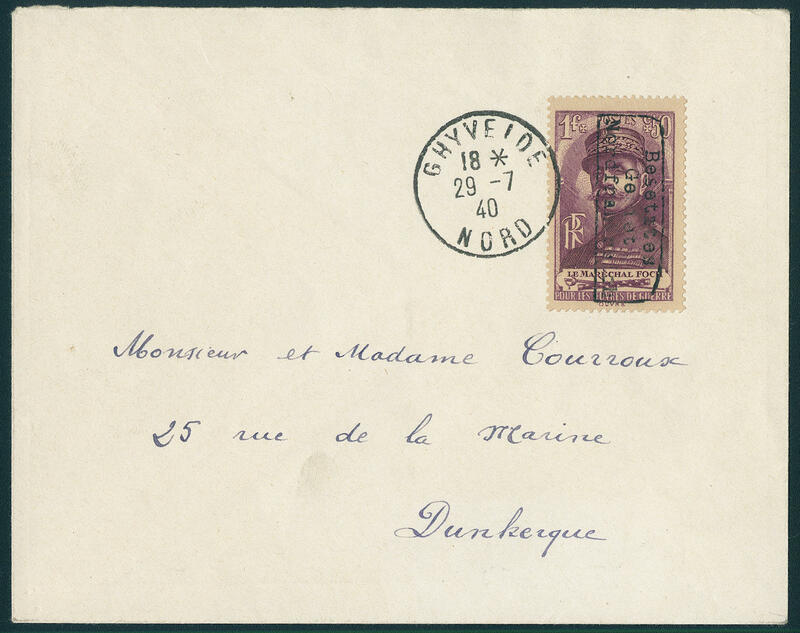 5690 ✉ 133,62 70 C. Languedoc with 30 C. Merkur, type I, as correctly franked mixed franking cover from \"DUNKERQUE 17.7.40\" to Ghyvelde with arrival postmark. Rare. Photo expertize \"the condition is perfect\" autumn VP. Michel 700,- €. 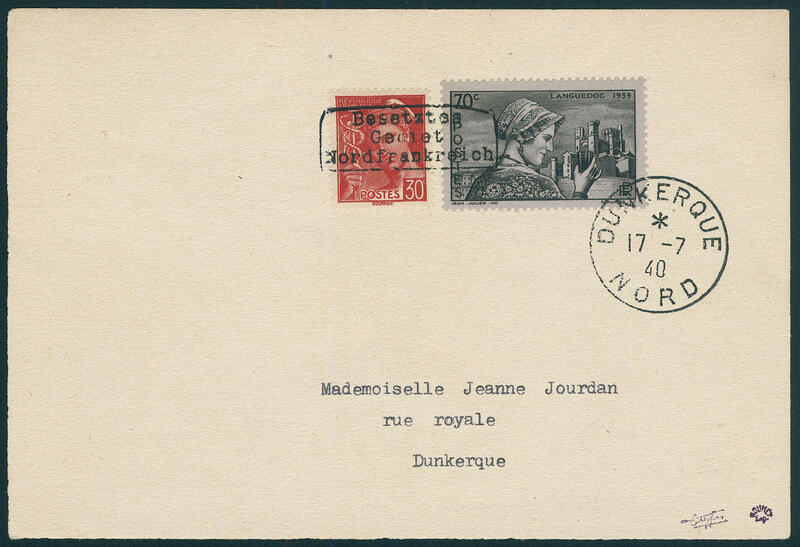 5691 ✉ 138,53 70 C. Mother with children and 15 C. Semeuse in the horizontal pair, overprint in type I, the special stamp irregular perforated, otherwise in perfect condition on First Day Cover from \"DUNKERQUE 1.7.50. 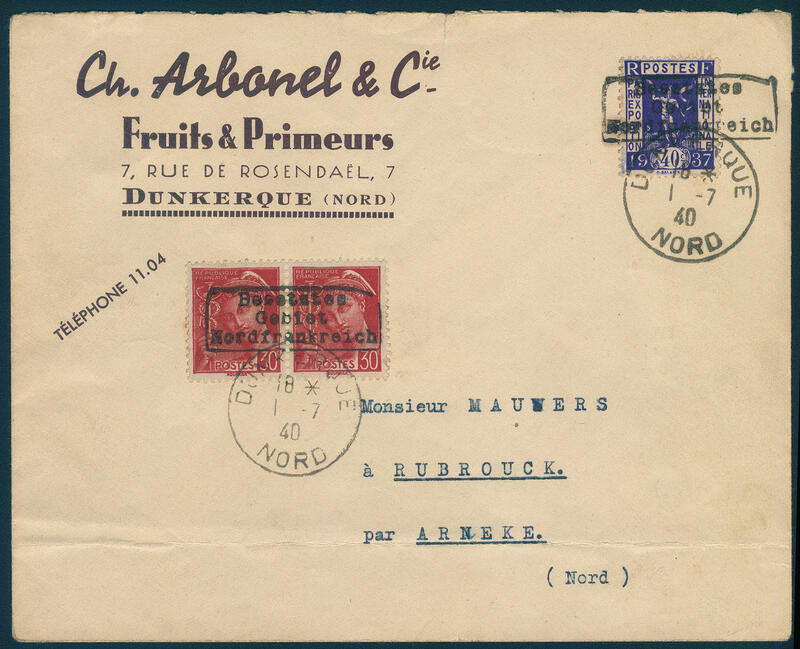 \" to Arneke with arrival postmark, cover in the margin region traces of usage. Rare! Photo expertize autumn VP. 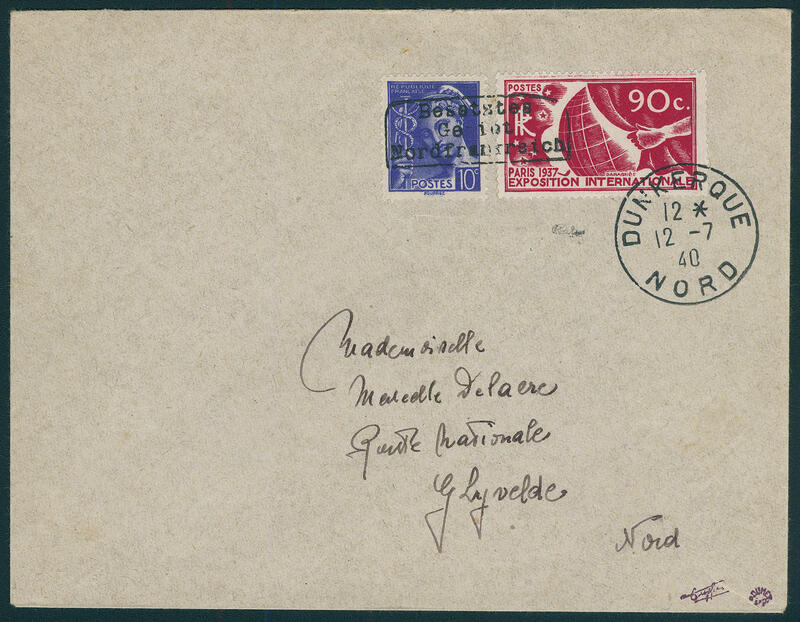 5692 ✉ 151,52 90 C. World exhibition Paris 1937 with 10 C. Merkur, type I, as correctly franked mixed franking on cover from \"DUNKERQUE 12.7.40\" to Ghyvelde with arrival postmark. Rare. Photo expertize \"the condition is perfect\" autumn VP. Michel 1000,- €. 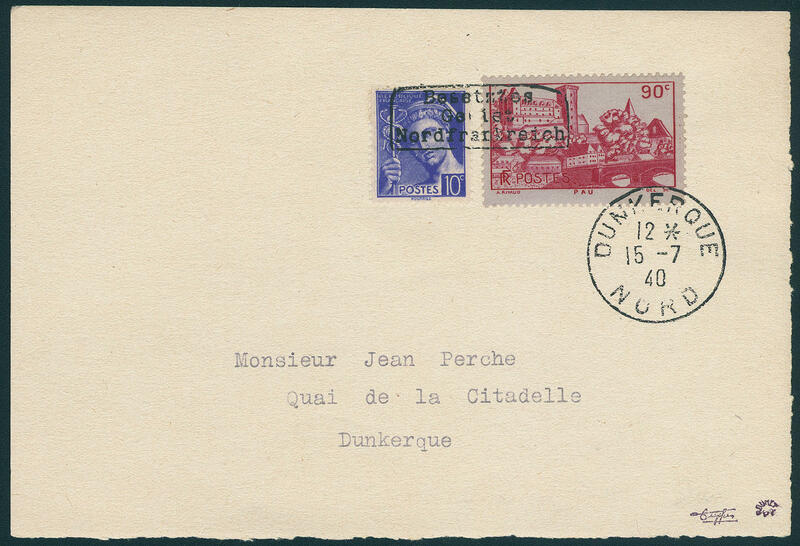 5693 ∆ 154,52 90 C. Castle count from Bearn with 10 C. Merkur, type I, as correctly franked mixed franking on cover front from \"DUNKERQUE 15.7.40\". 90 C. A little irregular perforated. Photo expertize \"the other condition is perfect\" autumn VP.